Thanks to a generous scholarship from the Illinois Collections Preservation Network, I was fortunate enough to take the class “Care of Paintings” with Cynthia Kuniej-Berry at the Campbell Center. Nestled in the small northern Illinois town of Mount Carroll, the Campbell Center offers a number of collections care and historic preservation courses. Someone once described the Campbell Center to me as being like summer camp for conservators — which is exactly what it felt like! This was a three-day course — I arrived on Sunday night and immediately went to a small reception and met my fellow classmates. There was a wide variety of backgrounds — from archives to registration to museum administration. It was really fun to meet so many people with shared interests. Our class started with the basics: the anatomy of a painting. I was taking this course because I didn’t feel comfortable working my way around a painting, and this aspect of the class was extremely beneficial. As a private practice conservator in Chicago, our instructor Cynthia had clearly taught many pre-program interns before. She emphasized the different parts of a painting and we all did condition reports on paintings which were donated to the Campbell Center. Cynthia also showed us many slides of different types of damage. This was really helpful because it is impossible to see everything that may happen to a painting, but given how long she has been in the field, Cynthia showed us many complicated examples. Since she is also in private practice, it was really interesting to see how people decide to place paintings in their homes. We saw a house that was glass windows all around it and in front of one of the windows the owners placed massive paintings. This, of course, caused numerous conservation issues which she then had to advise on. After we had written our condition reports, we spent a lot of time going through each of our paintings and learning the best way to document damage and the appropriate terms to use for each case. It was really beneficial to be able to see so many different types of damage right in front of us. Learning how to dust a frame. We also spent time doing some minor treatment: using the appropriate brushes and a vacuum, we learned how to dust a painting and its frame. We working on an extremely large painting so this turned out to be a little harder than I expected but we worked as a group and cleaned it up! 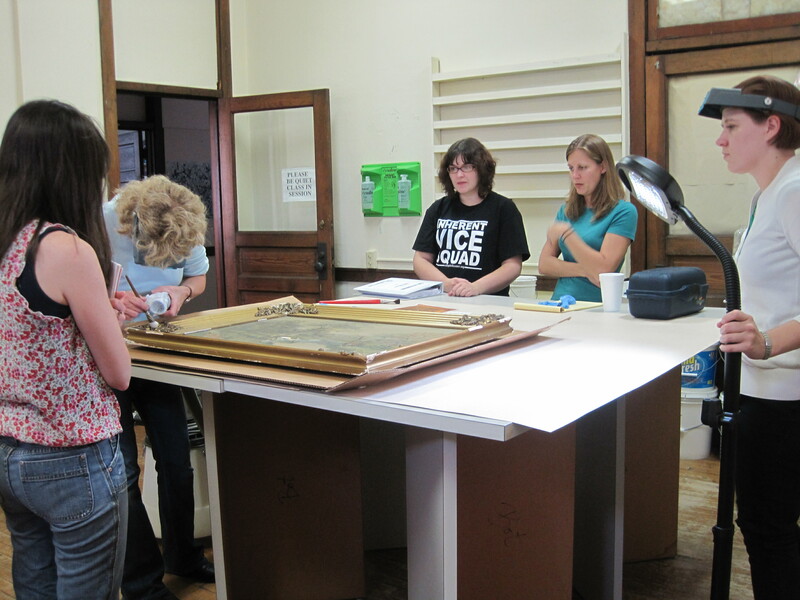 We also learned about the best way to store and transport paintings, particularly within a museum. 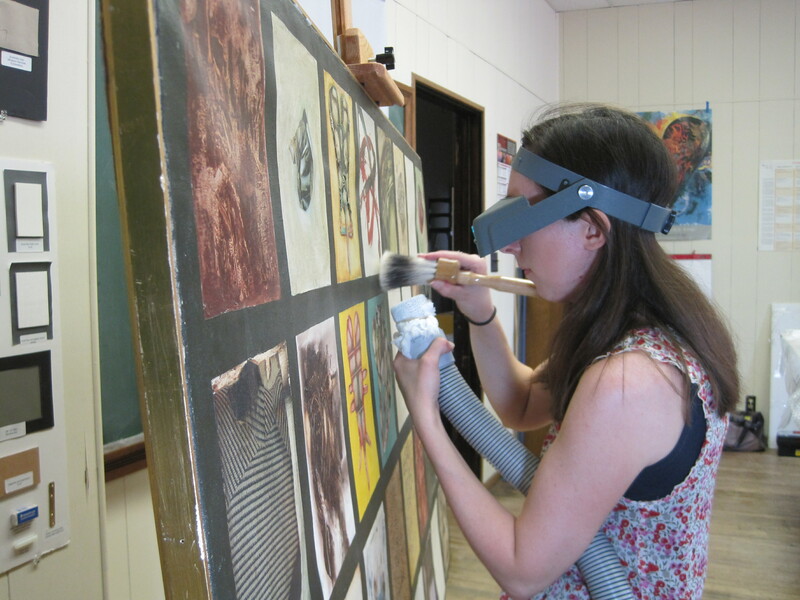 We went over the best tools to be using during conservation and even the proper easel paintings should be placed on. All of these little details seemed so obvious once we started discussing them but just didn’t occur to me before. As you can imagine, we learned many more things during these whirlwind three days; I wouldn’t be able to cover all of it in a blog post. It was great meeting so many arts and museum people in the Midwest and really beneficial learning from each other. I also specifically signed up for this class so that I could meet and learn from Cynthia, who I had learned so many great things about. She has an amazing background and a wealth of knowledge. I was particularly intrigued by her experience in private practice. I had always assumed that I wanted to work for an institution, but when she discussed how she was able to really work on a painting from start to finish — from researching the art history of a piece, to the conservation aspects, to communicating with the art insurers, it sounded really appealing. I really took away so many things from this course. If you are in the Midwest and have access to the Campbell Center, particularly if you’re pre-program, I highly recommend it! It’s a very warm and welcoming atmosphere that makes your whole time there so enjoyable. If you have any more questions about my experience, please feel free to contact me. A couple months ago I attended a disaster response workshop for cultural institutions, particularly libraries and museums, sponsored by the U of I’s Graduate School of Library and Information Science. Though I’ve been introduced to disaster response before, it was nice to get a more formal background. The workshop lasted three hours but the speaker gave us many links so we can learn more online.The first part of the workshop was a lecture where we learned about how to prepare for a disaster and then deal with the disaster as it is occurring. The second part of the workshop was a tabletop exercise where we split into groups and discussed how we would deal with a particular scenario. keep a log of places that disasters have occurred: when and why. For more information, you can find a disaster preparation and prevention checklist here. Life safety — make sure all humans are safe! One of the interesting things in this workshop was to listen to other peoples’ experiences with disasters. When I worked at the Spurlock Museum, a small cultural heritage museum at the U of I, I found a huge pest infestation in a large cabinet of baskets. We immediately started bagging all the baskets in the area and had to do a thorough investigation of where the pests came from and how long they had been feasting. If you have a disaster story, please share! For more information about this workshop, please visit this link! If you have more online disaster resources you would like to share, please post a comment below. Propane Tank and Blow Torch and Wax, Oh My!